Margarete Hyer is a New Jersey certified public school teacher, aquatics instructor, and former head lifeguard. With over 25 years experience of teaching swimming lessons, she has taught thousands of children and hundreds of adults, a complete range of swimming skills as well as water safety knowledge. Margarete holds a Masters degree in education and uses that background to teach art in the Ridgewood Public School District, as well as providing private instruction in flute. Honors include: being selected as a graduate council representative for The National Council for Accreditation of Teacher Education (Montclair State University) and nominated for both The Commissioner of Education Distinguished Teacher Award & Academic Achievement Award through Montclair State University. Based on firsthand experience, Margarete believes that all children and adults are capable of learning how to swim and overcoming fear of the water, provided they learn with a patient and qualified instructor. With an extensive amount of training in education and years of experience working with children, the highest level of standards are passed on to all of the instructors and lifeguards who make up the Finally Swim team. Quality and excellence in service is the way in which the Finally Swim team enables its swimmers to achieve success. How long have you been teaching swimming and how did Finally Swim come about? I have been teaching swimming since age 16 and established quite a following of swim lesson clients from the very start. Through studying for both college degrees, I used to work 7 days a week during each summer at Fair Lawn Memorial Pool! I was a lifeguard, who taught private swimming lessons on all of my available hours outside of the 40-hour work week, then I became an assistant head lifeguard, and soon after that – head lifeguard. I trained and managed over 50 lifeguards a summer and was very focused on keeping people of all ages safe in the water. The business of teaching children how to swim and teaching children & parents pool safety has been a lifelong commitment and passion of mine. Putting the name Finally Swim to the quality service that I provide was inspired by years of success that I have had with swimmers of all ages and pool parties of all kinds throughout Bergen County. Have you been a big swimmer your whole life? Yes I have been a swimmer my whole life and absolutely love to be in and around the water! I did swim competitively on both summer and high school leagues and I am grateful for the incredible swim coach, Judy Montalbano, who trained me. Judy was a master technician who focused on each and every detail regarding technique. I have taken all that I learned from my former swim coach AND I infuse that knowledge into my own methods of instruction. Was Finally Swim successful from the start or did it take some time to get the word out? Yes, Finally Swim has been very successful. That success is due to the fact that myself and the instructors and lifeguards who work for me are also passionate about swimming, being in the water, and working with children. It’s a combination that is not easy to find. The most important aspect of running a business like this, is that the children and adults who we teach and protect, feel safe when we they are in our presence. We arrive with genuine enthusiasm and intend to get significant results with every single lesson we teach. The goal is to safety proof every child and adult as quickly as we can. That is what makes Finally Swim different from the average local back yard swimming instructor. We are dedicated, reliable, responsible, friendly, and professional. When does Finally Swim operate? All summer? Every day? Finally Swim provides service of swim instruction and Lifeguarding primarily from May through the beginning of October. We provide service at home and condo development pools. For clients who have indoor pools, service is provided throughout the cooler months as well. How many clients do you have and what towns are they from? Roughly, what percentage are Ridgewood residents and what are the ages that you teach? Is your business rare? I haven’t heard of people giving personal swim lessons at someone’s house before. I imagine the response has been positive from your clientele? The business of teaching children how to swim is not unique, however the methods I use, the approach that I take, the passion that I feel for safety proofing children, and the commitment that I make to swimmers of all ages in my surrounding community is entirely unique in comparison to what other swim services have to offer. Finally Swim provides a nurturing and personalized service that is tailored to the needs of each swimmer and homeowner. Lessons in your home pool, and safety instruction that pertains to your pool and surrounding environment is a delicacy of sorts! As you can imagine, the response to Finally Swim has been well received and business flourishes primarily through word of mouth. How long are lessons typically? What do they consist of? Your website mentions that you offer group lessons. Lesson duration depends upon the individual swimmer’s needs and the swimmer’s age. The quantity of lessons that each swimmer needs per week is also highly individual. All essential swimming skills and safety skills are covered in private, semi-private, and group lessons. Mommy and Me classes are offered for children under the age of 3, water therapy for all swimmers (including those with special needs), and swim team tryout & endurance training is available as well. Many of Finally Swim’s students have advanced to competitive swimming leagues! Will you teach children who have no swimming experience whatsoever? Are there more instructors besides you? 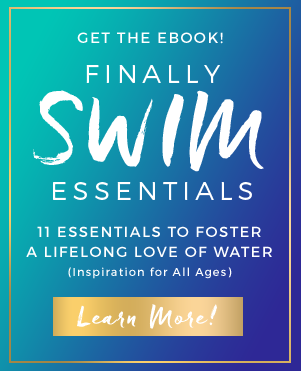 Children of all ages, without prior swimming experience, are always a welcome addition to the Finally Swim team of instructors who are trained to teach all learning styles and needs using the Finally Swim methods. All instructors are fully certified lifeguards and experienced instructors. Like myself, they have competitive swimming backgrounds; have a passion for working with children, a passion for being in the water, and a high level of awareness regarding safety in the water. We all take the business of keeping children and adults safe very seriously. This protective attitude comes from extensive lifeguard training and experience. We are also a breath of positive energy and have a knack for making children feel comfortable with us, both in and out of the water. You are an art teacher at Benjamin Franklin Middle School? Have you had any former swim students in your class years later? Believe it or not, I have been teaching swimming for so long, that a handful of the children who I taught at the YMHA in Washington Township have actually been in my art classes. It’s very exciting for me to see how they have grown from age 3 or 4 and up! I have also taught many siblings of my Ridgewood students how to swim as well as children of colleagues. Do you live in Ridgewood? Although I do not live in Ridgewood, I have spent my whole life in Bergen County and feel as though Ridgewood has become my home away from home. Along with teaching art in Ridgewood, I am a flutist at Mount Carmel Church and spend a lot of time enjoying all that Ridgewood has to offer. It is a wonderful family oriented community that is a special place to be a part of. What have been some of your favorite memories from Finally Swim? Ever run into children that were tough to deal with or reluctant to get in the pool? All of the memories that I have of teaching children how to swim are fond memories. There is nothing more rewarding than teaching a child, or even an adult, how to swim for the first time. The Finally Swim team of instructors, along with myself, is focused on prevention, awareness, skill, and strength. To walk away knowing that there is minimal risk of these swimmers ever drowning in the future, is a tremendous feeling. We of course have worked with children who are reluctant to get into the pool. Usually within one or two lessons, they put their faces in the water and float for the first time! As I always say, it’s like magic, but that magic can only occur with the right instructor and the unique approach that we utilize. The Finally Swim team of instructors is ready to take on any challenge and we expect nothing but success from our swimmers and ourselves! Overall, what do you get out of this experience and what do you hope others will gain from it? Would you like to continue with your business and expand in the years to come? Overall, the goal of Finally Swim is to continue touching as many lives as we can throughout time. We bring to our customer’s homes a level of professionalism, enthusiasm, and passion that is unsurpassable! We are responsible and reliable. Our approach is unique and tailored to the needs of each and every swimmer. We expect results and we guarantee that this swim experience for all participants will far outweigh the previous experiences that these swimmers may have had in the past. Finally Swim’s slogan is Swim Safe Swim Strong. The ultimate goal for all of our swimmers is to feel safe and strong in the water!